Less stress, fat, couch, and excess? Excellent advice, which I intend to take–until I can no longer take it! Difficult prompt but I think I got there in the end. I look forward to reading everyone else’s! Hi Andy! Welcome aboard – liked yours, but was unable to leave a comment because you don’t have Name/URL enabled. Hope to see you again! I love your line on youth, but regrets: Never. Hope you had a good vacation. A great range of haikus on different kinds of health! And the Sinatra one is a cute finale! 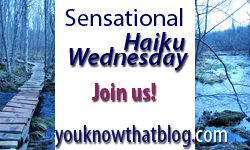 My first entry in Sensational Haiku Wednesday. Hope I did it right. You certainly is a fleeting gift that no one sees til it’s gone! wonderful work on these! Very nice. Your theme this week coincides nicely with my rant yesterday; thank you. Nope haven’t seen the FB pictures. I’ll get there soon. :) MWAH!!! I think the keep breathing thing is key! My great grandfather lived to 104 and smoked a pipe, the occasional cigar, and loved his whiskey and beer! SORRY I haven’t been around. I was in a funk. I think I’m back now though. This was really difficult for me, as I could not get away from the literal. You did well :) I still can’t leave a comment on your blog though…! I just wrote a health related limerick.